Competition for nesting sites could explain why some birds and bumblebees are declining faster than others. Research suggest animals that build their nests in early spring may win the fight for available habitat at the expense of late breeders. Conservation efforts should focus on ensuring rare species have enough places to nest, say scientists. 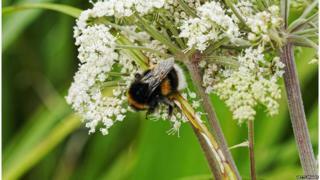 For example, areas could be left to grow wild between spring and summer to help bumblebees establish nests. Habitats such as hedgerows and hay meadows are being lost in many countries, meaning that fewer nesting sites are available. Competition among animals for a suitable place to nest could explain why some species are struggling to survive. "Ecologists understand why some groups of species are declining more, such as why farmland species are declining more than woodland species," said Dr Andrew Higginson of the University of Exeter. "But an enduring mystery is the big variation in the declines of closely related species. Fighting over nest sites may be part of the reason - when nest sites are hard to come by, the species that will suffer most are those that nest later in the year." The University of Exeter study analysed population changes in more than 200 bird species and 40 bumblebee species around the world. The population data was combined with a mathematical model that used game theory to predict the likely behaviour of bees and birds when faced with competition for nesting sites. It calculated the implications of fighting for nesting sites, based on the size of each species, the time of nesting and the quality of the nesting site. The study found larger species that nest early generally do better, while smaller bees and birds that nest later in the year lose out in the struggle for habitat. For example, the chaffinch is doing well in the UK, while the goldfinch is on the decline. "We need to have a more holistic approach to providing good habitat for animals," Dr Higginson told BBC News. "We need to worry about the whole life cycle not just what they eat." He said conservation efforts for animals such as birds and bees tend to focus on providing food. Restoration and provision of nest sites should be an urgent priority, he said. This could be as simple as waiting to cut hedgerows until later in the year when all animals have nested or providing more boxes for birds to nest in. The research is published in the journal, Behavioral Ecology and Sociobiology.